Shambala 2013 Going Back to My Roots! – Creative Dynamo Ecotainment! Shambala 2013 Going Back to My Roots! The first thing that strikes you is the sheer diversity of acts, arts, workshops, venues, areas, facilities and fancy dress. Let’s summarise and call this magic ingredient Participation or You! Sham is fiercely independent and it shows through the line-up by booking alternative acts and less big names but equally talented musicians & DJs from around the globe. It is the place to see those artists breaking boundaries, up-and-coming acts alongside more established critically acclaimed performances. This attitude fosters creativity, nurtures new talent and creates a very fertile playground for your imagination. This ethos reminded me of Boscombe Community Fair back in 2001 when I was that ‘arts guy’ who also wrote press-releases and went to endless meetings hence the title ‘back to my roots’. Shambala is billed as ‘Adventures in Utopia’ and it pretty much delivers. It’s more than just a music festival, it’s not mainstream but soul food and it sustains me along with many other Shambalans throughout the year. Each year is full of surprises and there seems to be more and more to discover. Daytime shenanigans are upbeat, tongue-in-cheek and family friendly e.g. the fancy dress roller disco or table tennis tournament hosted in the dance tent. Crazy golf on the lawn and Pirates versus Gangsters flash-mob on the pirate ship. If this doesn’t grab your attention consider the new Play House a 400 all-seater big-top which was playing to full houses most if not the entire weekend. Complete with foyer, bar and ushers this multi-purpose venue was packed with plays, comedy, puppetry and circus throughout the festival. The Play House foyer was a decent enough size to double up as a dance club to rival the numerous other late night party venues. If you want to rave the night away there are many many secret themed bars and venues for you to explore. So let’s mention a few of those hidden venues too there was the dancefloor that was accessed through the tardis style police box! Another that looked like a Chinese laundry, the Swingamagig a speakeasy style joint playing late into the night and the waiting room a 1940’s style live lounge. Leading nicely into… another area where Shambala seem to excel is that it’s full of surprises and appeals to the child in all of us. You can expect the unexpected as it is full of hidden gems tucked-away and not in the programme nor timetabled – just like Tip of the Pops! Now let’s introduce the costumes and fancy dress as I have never been anywhere where people have put so much thought and effort into their costumes you cannot tell if they are an act or not. The costumes are outrageous, hilarious, make-up glamorous and glittery visit the Jazzification Station if you don’t know what look you want and if you need a haircut or beard trim try the Shambarber! Nice write up. first time back after a 4 year hiatus, this time with a 2 year old. 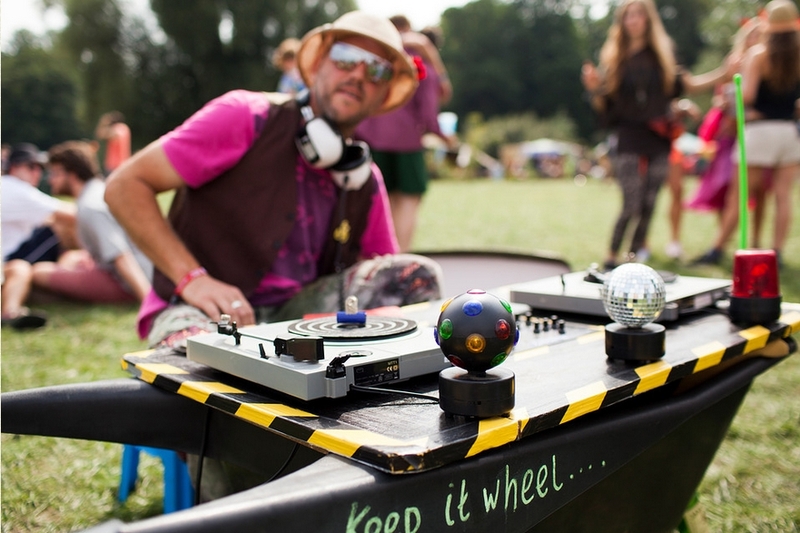 If you are spinning tunes like the one above I will be sure to come and find you to bust a groove!